CALX Extended Life Antifreeze and Coolant is a premium quality cooling system fluid containing advance formula inhibitors that provide 5-year, 150,000 mile extended life protection. Multi-functional inhibitors with dispersants provide full system protection from freezing, overheating, rust, scale and multi-metal corrosion. It is recommended for use in cars, trucks and small diesel engines and is fully compatible with all major brands of premium antifreeze/coolants. 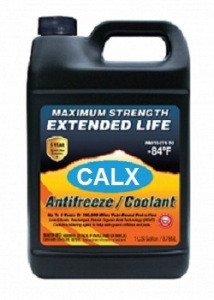 CALX Premium Extended Life Antifreeze is formulated both as a Ready-To-Use, 50-50 premixed and a Full Strength Concentrated Antifreeze, which can be diluted for individual freeze and boil-over protection. Additional SCA are required for diesel truck service. Maximum protection is based on a complete change of existing cooling system antifreeze. Always refer to your owner’s manual for cooling system capacity and recommendations.